You can experience JUVÉDERM® XC injectable gel with a quik, in-office procedure and minimal downtime. During treatment, your healthcare provider will ease JUVÉDERM® XC under your skin to smooth out the moderate to severe facial wrinkles and folds. You'll see the difference instantly! Side effects are usually mild to moderate, lasting 7 days or less. Individual results may vary. Real results of paid users. Photos taken 4 weeks after treatment. In the United States, JUVÉDERM® Injectable Gel is indicated for correction of moderate to severe facial wrinkles and folds (such as nasolabial folds). JUVÉDERM® XC provides enhanced comfort when compared to the non lidocaine JUVÉDERM® formulations. 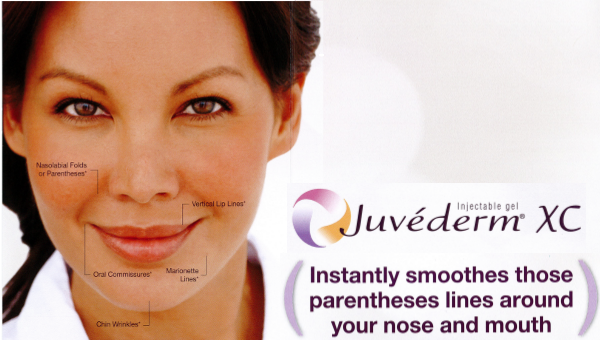 Important: For full safety information, please visit www.juvederm.com or call Allergan Product Support at 1-877-345-5372.